I received a "pickup notice" from my postman yesterday indicating that my package had arrived and it was for pickup at the main post office. Weee!, or so I thought. Just when I was so full of glee that the Gundam 00 kits had arrived from HWJapan, I looked at the strip of paper and noticed that the date was Sept 8, 2009. Heck, that was almost over 2 months ago. Turns out that that was the EMS package from HLJ that contained my VF-25G Messiah. 2 months for the notice to arrive, good thing I had decided to go to the post office already to check on whether the package had arrived instead of waiting for the notice. 2 months, for an EMS package. Funny that the VF-25G had already been assembled by the time the pickup notice had arrived. In the UK right now there are delays in the national mail service because the workforce is on strike. In my country, I always feel that our mail service is on strike, with the pace its working at. 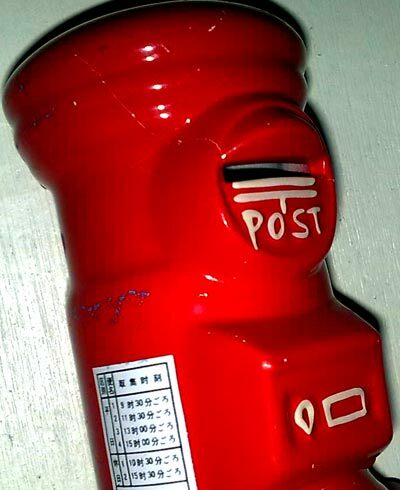 The above picture is of a piggy bank that was fashioned out to be a Japanese post box. I bought it in Japan at one of those hyaku-en stores for a 100 yen. Its seen better days, having fallen once and been patched up with 2 part epoxy glue.